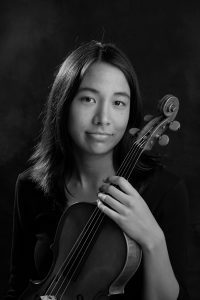 Violist Rose Hashimoto is originally from Seattle, Washington and currently resides in New York City. Rose is Co-Artistic Director of Listen Closely Inwood Chamber Music Initiative, whose goal is to build community in the Inwood neighborhood of Manhattan through music. Rose has performed with ensembles including Shattered Glass, A Far Cry, the Evergreen Quartet, and the Thalia String Quartet, who served as the Quartet in the Community for the 2013 Banff International String Quartet Competition. She has performed on the air on WQXR radio, All Classical Portland, and Live from Lincoln Center, and at festivals including Birdfoot, Prussia Cove, Lucerne, Yellow Barn, Taos, and Kneisel Hall. Also a dedicated educator, Rose is a certified Suzuki teacher and serves on the faculty of the Lucy Moses School at the Kaufman Music Center. Rose earned a Bachelor of Music from Juilliard and a Master of Music and Professional Studies Diploma from Mannes College of Music. As a winner of the Mannes concerto competition, Rose performed the Schnittke viola concerto with the Mannes Orchestra in 2012. She was the recipient of the George and Elizabeth Gregory Award for Excellence in Performance from Mannes. Rose’s major teachers were Toby Appel, Hsin-Yun Huang, and Laurie Smukler.